Thatched barnacles, Semibalanus cariosus, and goose barnacles, Pollicipes polymerus. 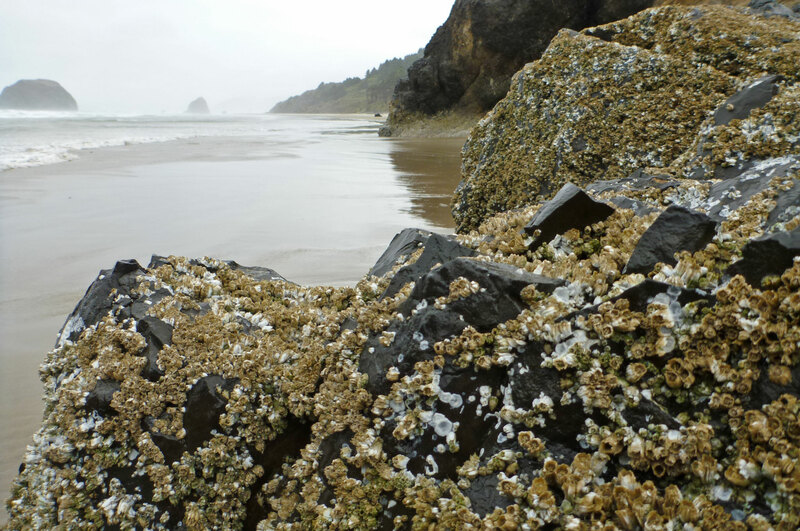 There are a lot of impacts in the exposed surf zone and barnacles are always breaking away from their rocky homes and washing up on the sandy beaches. These thatched barnacles, Semibalanus cariosus, the ones piled one upon the other, are among the most common barnacle finds on TOS beaches. They can get pretty densely packed and here you can see at least three age classes, along with another barnacle hitchhiker, the goose barnacle, Pollicipes polymerus. Below I’ve assembled some images illustrating these and other barnacles I have encountered awash on the beaches and intact on the rocks. Acorn barnacles live in the mid and high intertidal zones where they can be incredibly abundant. 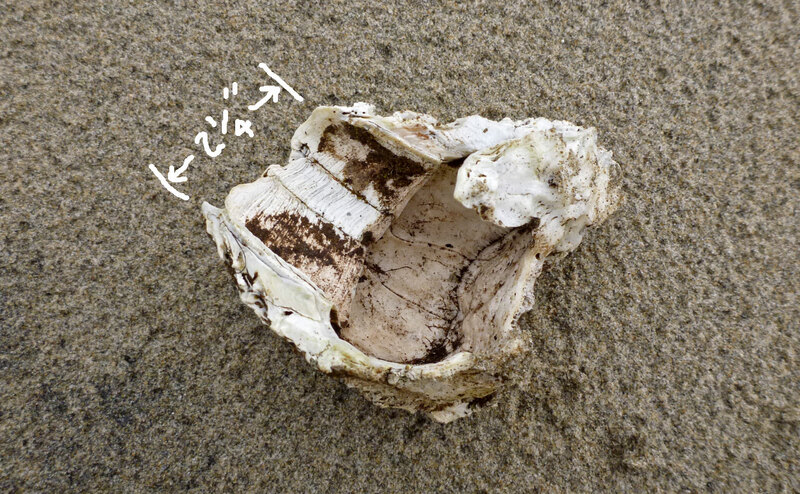 The whitish patches in both of the above photos illustrate the effects of recent impacts, mostly from logs and other debris tossed into the barnacle zone by heavy surf. 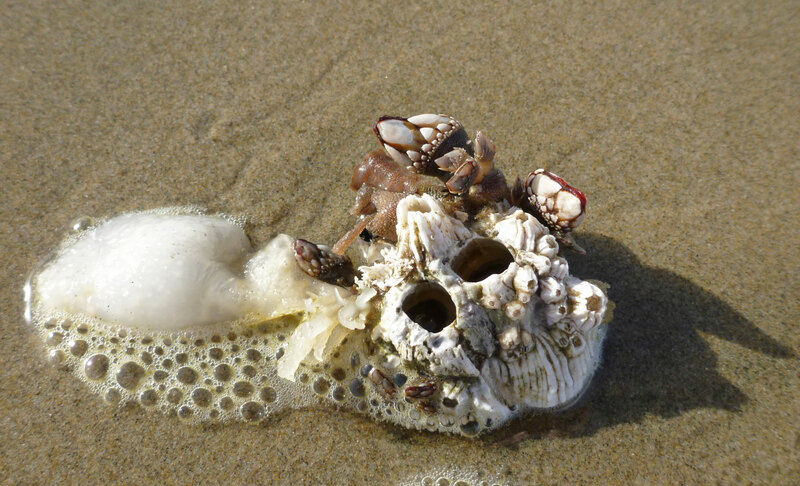 Acorn barnacles make up in abundance what they lack in size. While in uncrowded conditions they can achieve a hefty 3/4″, these are only about 1/4″ high and wide. On the other end of the size spectrum is the giant barnacle, Balanus nubilus. In this view you are looking into the inside of the test, or shell, where the living barnacle once lived. 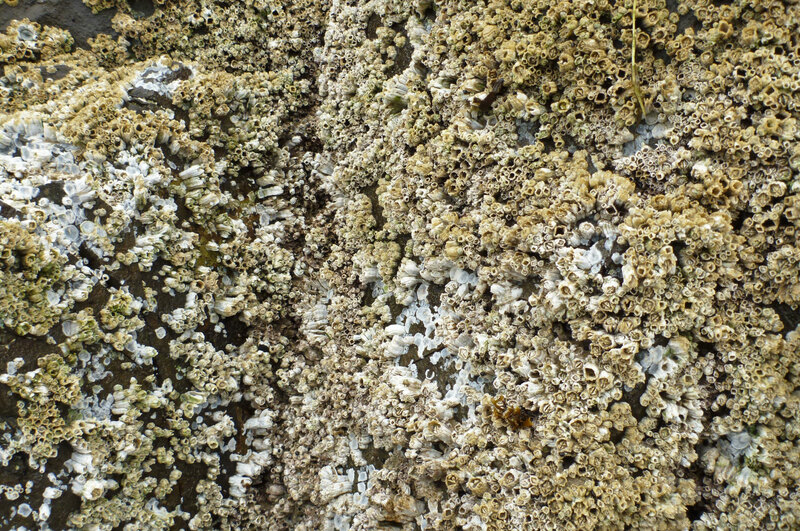 Giant barnacles can sometimes be found in the very lowest intertidal zone, but for the most part they are subtidal. I found this partial test on the beach on November 2, after one of the first big storms of the season. To see some other items I found in the wrack that day, check out Wrack Line 2013 and scroll down to November 2. Giant barnacles are one of the worlds biggest barnacles and the specimen shown above is a pretty good sized individual. Goose barnacle, Pollicipes polymerus, from the stomach of a redtail surfperch. Once in a while, barnacles are preyed upon by surfperch. 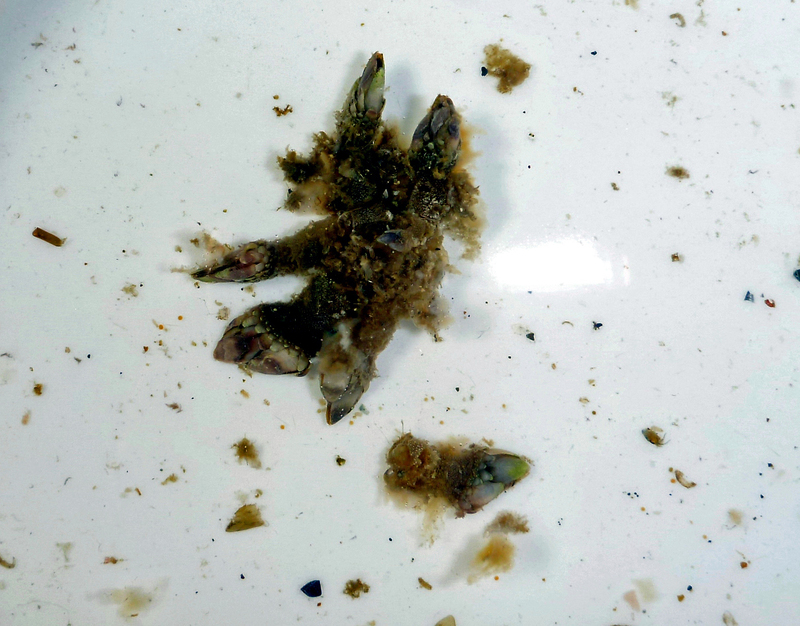 I found this clump of goose barnacles in the stomach of a redtail surfperch. To see some other surfperch food items and a great video of mallard ducks dabbling in the surf zone, check out Dabbling with Crustacean Competition.